The old lady stared wide-eyed at me. Her granddaughter, who was diligently practicing her characters on the dining table, eyed me curiously. Whatever the stranger at the door was propositioning was clearly more interesting than homework. Her son suddenly emerged from a small rattan bed pressed against the wall, evidently roused from his nap. He assessed the situation and finally relented when curiosity got the better of him. My friend followed in behind me, we chatted with the family briefly upon entering the neat but cluttered room that housed all three generations of the migrant family. 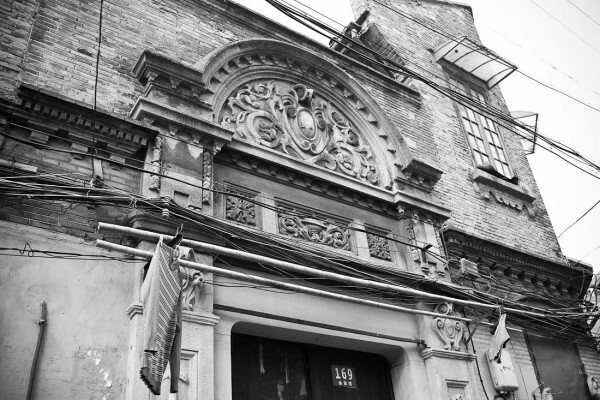 I explained our amateur interest in old houses around Shanghai and about Singapore, where we were both from. The earlier icy walls quickly melted and in a sign of Chinese familiarity, they soon ignored us as we went about our business. To our disappointment, a giant air-conditioning unit protruded obtrusively from the left of us, blocking the coveted view. All that sweet-talk with the family had come to naught. The old lady watched us in deep discussion about other alternative spots. I declared rhetorically that I needed to buy that ladder I always wanted to photograph shikumens, even if it weighed a ton. “Or you could try the roof.” She said, amused at our predicament. 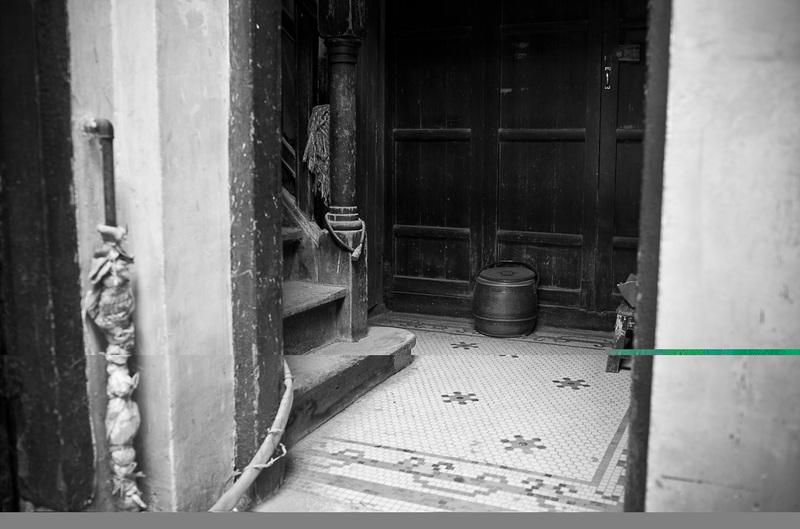 And so, bearing our clunky gear, we trudged up another flight of dusty and narrow steps, and emerged on a small concrete deck that served as laundry room and garden. The sun was brilliant and warm in our faces and it was a perfect day to watch the world go by from the modest three floors up. Below, residents on bicycles leisurely wheeled by, old folks chatted outside while basking in the slivers of sun rays that streaked across the alley. 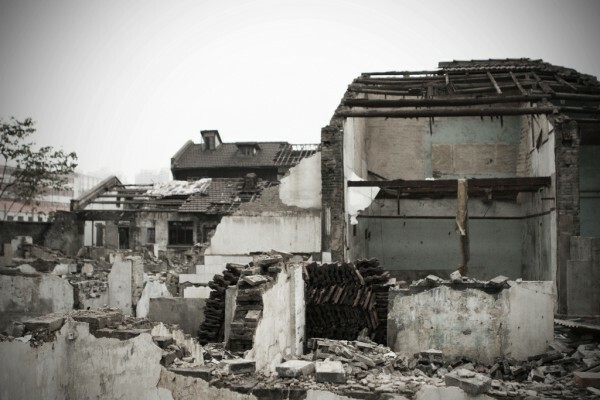 Surrounding us were low thatched rooftops of old housing in Old Town (老城厢), dotted by small dormers and the occasional pigeon coops. 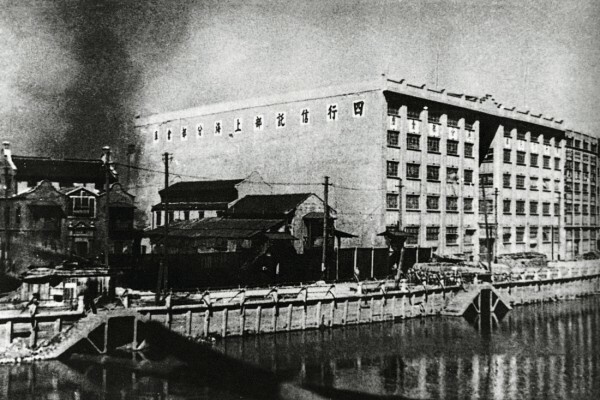 The compound in question was Jiuan Fang (久安坊) or very loosely translated “Long Peace Compound” was an excellent example of new-styled shikumen lilong housing, with wider bays, high walls and a large fenced-in courtyard offering a great deal more privacy. 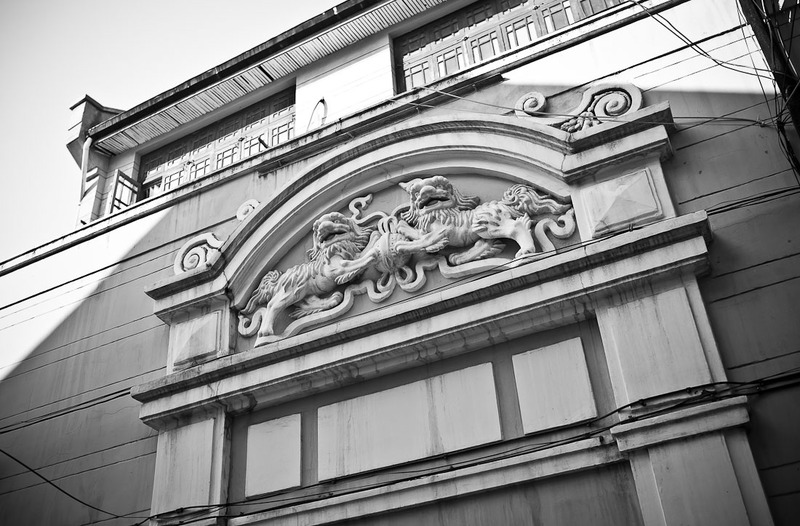 The pediment housed two majestic Chinese guardian lions (石獅) playfully poised with their paws on a decorated ball. Above the arch rested two small European gables. The elegant marriage of European and Chinese motifs could be seen on each door of the compound. 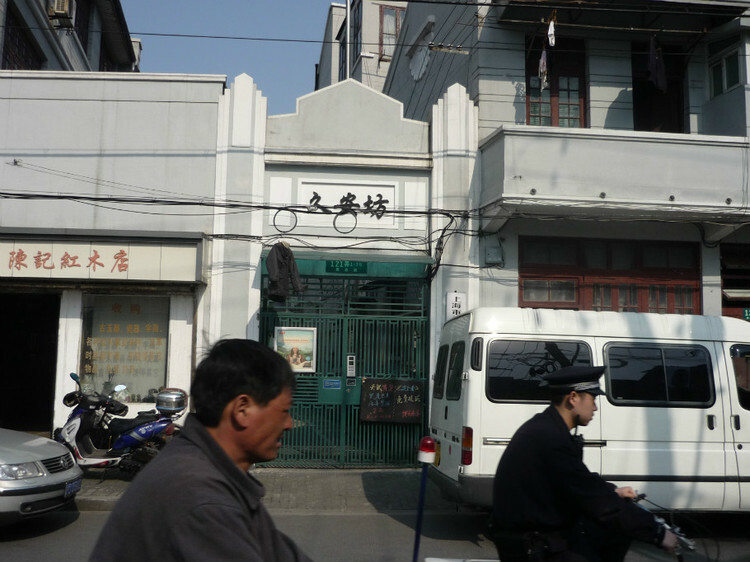 A Chinese blogger featured comparative shots of the compound walls in 2004 and 2012 (see below), and you can see hints of Art Deco-inspired deesign on the gated entrance and balconies. 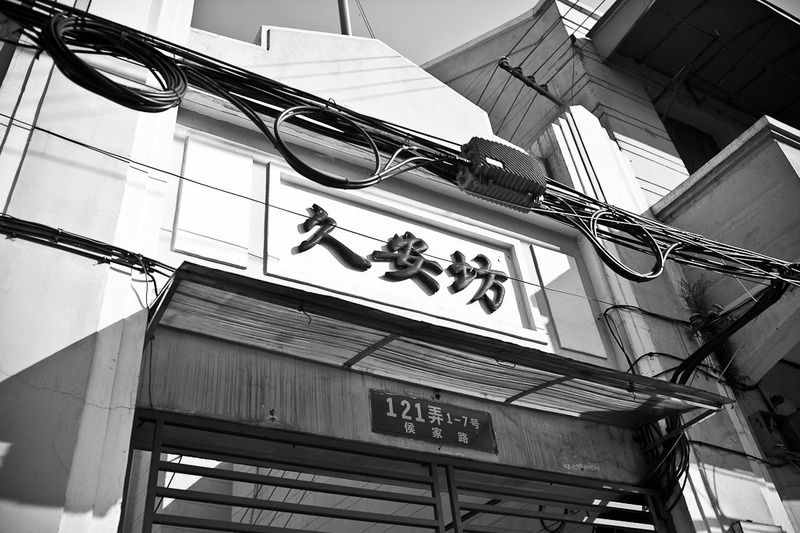 (I discussed the influence of Art Deco on Shanghai’s shikumens in a previous post.) According to him, the compound was occupied by more senior government officials, wealthy families and the intelligentsia before Communism. 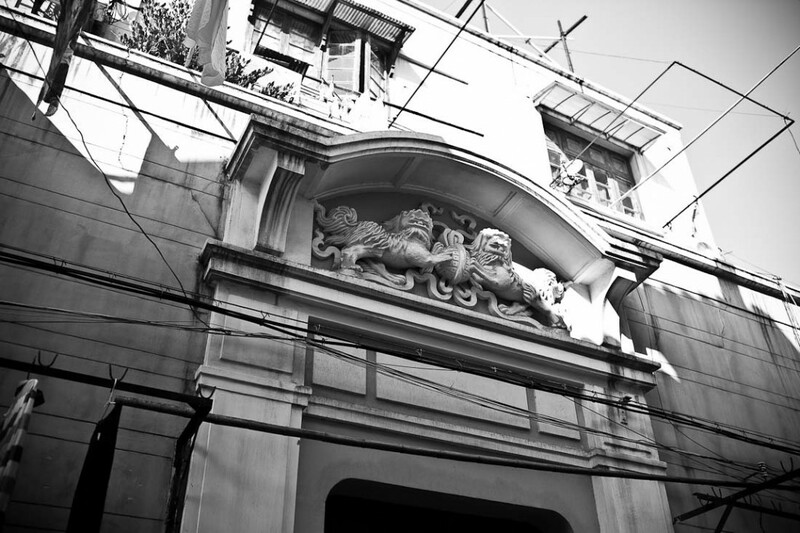 Hence, the choice of Chinese guardian lions (石獅) was apt since they traditionally stood in front of Chinese Imperial palaces, Imperial tombs, government offices, temples, and the homes of government officials and the wealthy, mainly because they were believed to have powerful mythic protective benefits. 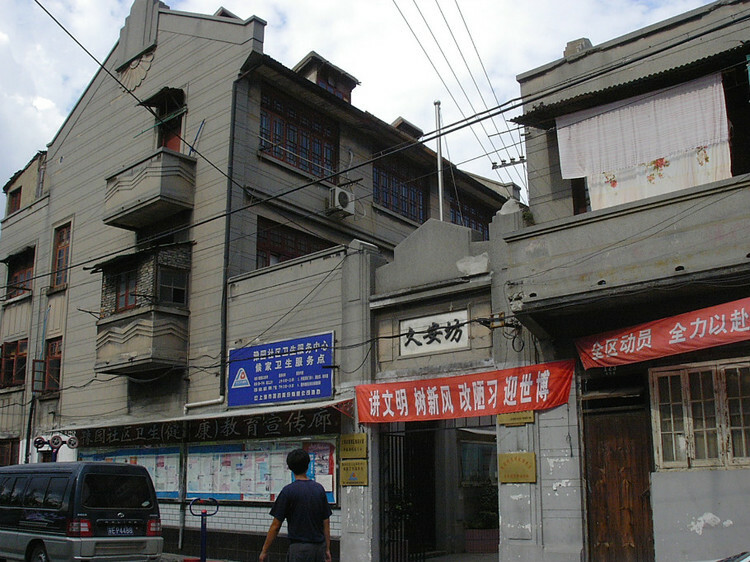 Source: 上海老城厢的回忆 Jiuan Fang entrance on Houjia (候家路) in Old Town in 2004 (first) and 2012 (second). Alas, for all our efforts, the rooftop view facing Jiuan Fang was not perfect either, a little too slanted for my liking. But we were able to peer into the well-furbished second floor of the compound. This is the life of lilong living, a little like compressed apartments in Hong Kong or Manhatten where your life is exposed to the neighbor just yards away. 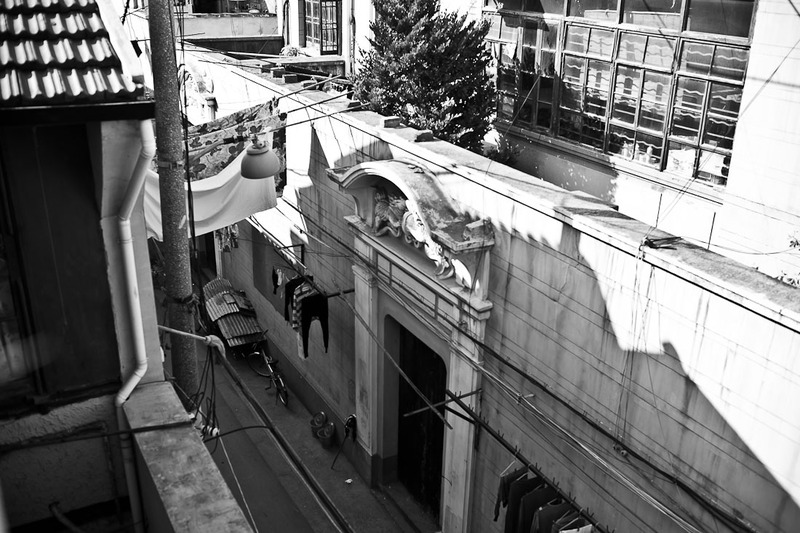 Opposite, framed by large windows, a middle-aged woman was mending clothes. Accoutrement of teacups and small potted plants lined her window sill. Having had our fill of the landscape, we eventually departed to find another compound, preparing to make more new friends for that perfect aerial shot. The little girl whom we visited earlier stuck her head out of the window and waved us goodbye.